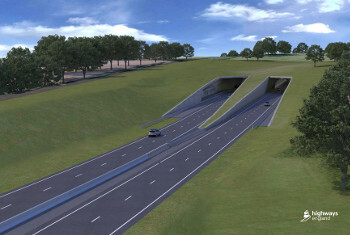 The Department for Transport (DfT) has confirmed it expects to receive billions in cash from the Treasury under the next Spending Review to pay for the Stonehenge tunnel (pictured) and associated works on the A303, and the Lower Thames Crossing. The news comes after chancellor Philip Hammond announced an end to existing private finance models in the last Budget, an approach that had originally been slated in to help pay for some or all of the two mega projects. Highways England boss Jim O'Sullivan had previously told Highways he suspected time had run out to find alternative finance mechanisms for the schemes if they were to be delivered on schedule, suggesting it would have to be paid for directly from the public purse. He said: 'It will take a period of time to design a new type of public finance mechanism that satisfies the chancellor's requirements for value for money. Now Bernadette Kelly, permanent secretary at the DfT has confirmed in a letter to the transport select committee that the two schemes are set to be publicly funded.